Line a mini muffin pan with mini liners. In a large bowl (or measuring cup for easy pouring), warm the coconut oil and butter just until melted. Give it a quick, gentle stir to blend. Add the cocoa powder and stir until dissolved. Add the marshmallow fluff powder and stir until incorporated well. Add a pinch more of the fluff powder until desired sweetness is reached. 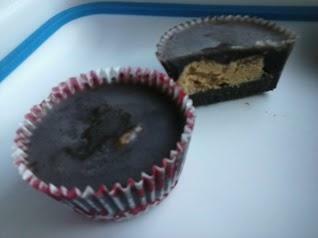 Pour ½ of the chocolate into the muffin liners, filling them about a third of the way. Pour slowly as they up faster than you expect. Place pan in freezer to allow the chocolate to harden a bit. This should only take a few minutes due to the coconut oil. While the chocolate sets up in the freezer, combine the peanut butter and fluff powder in a bowl and mix until smooth and powder is well dissolved. At this point, the mix will be an almost doughy consistency. Add the drizzle of cream and mix well, thus smoothing out the consistency. If you prefer, you can make it a tad sweeter with more fluff, or a bit creamier with a few more drops of the cream. Remove chocolate from the freezer. Using a spoon or your fingers, place a small dollop of the filling onto each of the chocolate shells in the pan and press down gently to flatten them a bit. 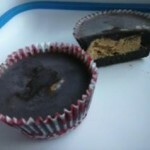 Top them off by pouring the remaining chocolate over the top of the peanut butter in each cup. Place pan back in freezer for a few minutes to let the top layer of chocolate set up. Once the top chocolate layer has hardened, remove the cups from the pan and place them in a sealed container and store in fridge or freezer.